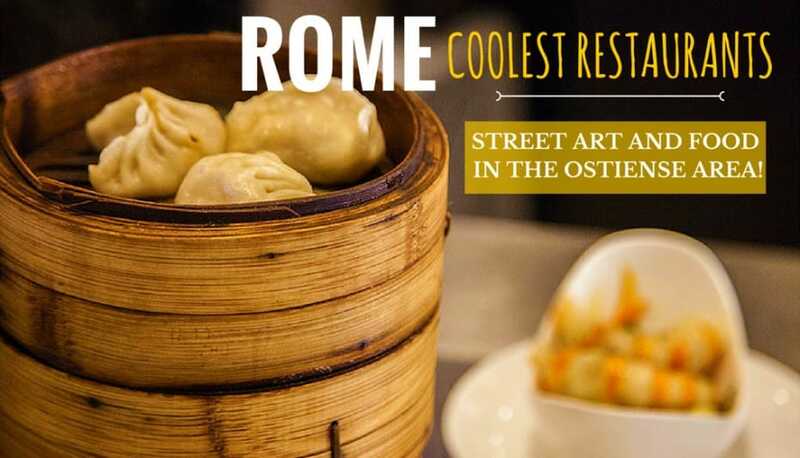 Where To Eat In Rome: A Guide To The Ostiense Area Coolest Restaurants! EATING IN ROME? IT’S TIME TO TRY SOMETHING DIFFERENT! You can find a lot of travel guides to Rome, focused on sightseeing, archeology and things to do in the center. But the Eternal City isn’t only its historical center: there are many areas worth visiting, such as Ostiense, recently renowned as “gourmet district”. Follow this itinerary off the beaten path and discover why a lot of artists and foodies love Rome! What if I told you that you could experience it with a local and like a local? Sounds even better right?! I’ve lived in Rome for 3 years and I know first hand that the Romans are some of the most welcoming, fun and outgoing people in Italy (I literally love them!). If you want to have a real culinary and cultural experience, check out this website! It’s called withlocals and it will help you to connect with locals through food and experiences, including real local traditions, and why not, sharing stories and laughters with the colorful people from Rome! An experience like no other, especially in the city that, no matter where I go, I still consider to be the best in the world. And now… back to our yummy restaurants! The definition “The Sistine Chapel of the Street Art”, perhaps bombastic, was given by a Time magazine journalist who wrote an article about the mural art trend in Rome and Ostiense as one of the most interesting places where to practice this expressive language. Street artists from around the world created their works on buildings, disused warehouses and railway underpasses, more than 30 large-scale works that together represent an open-air museum. 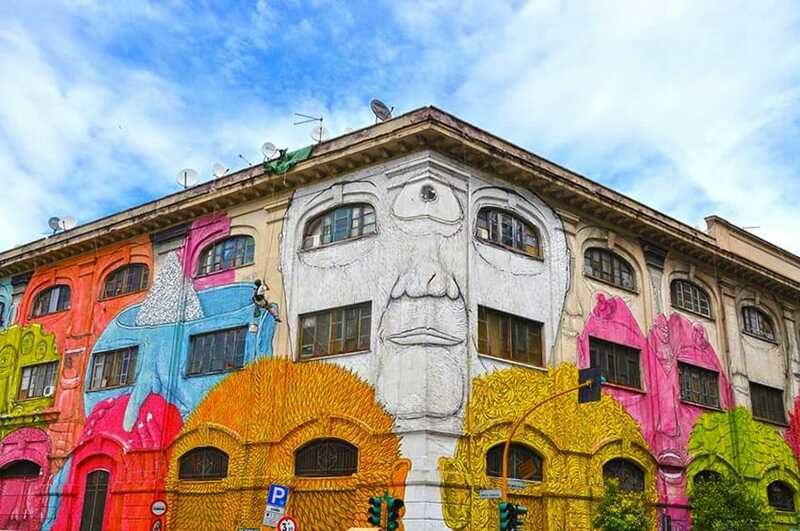 Take a walk in Ostiense, you’ll be surprised by the modernity of the neighborhood and you will find many appetizing venues scattered over the district! People with a sweet spot for fusion cuisine should go to La Dogana Food, the biggest oriental restaurant in Rome, fully renovated from a warehouse and characterized by the mixture of different culinary traditions, specifically Chinese and Japanese with some Italian specialties to make the buffet more varied. The style of the restaurant recalls the trendy New York lofts; The venue can host more than 500 customers thanks to its large size and the All You Can Eat formula allows to freely choose your own menu. 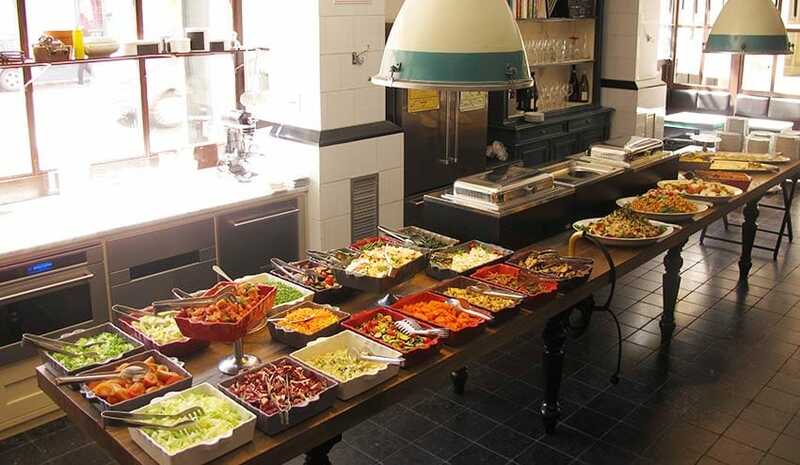 One of the hallmarks of La Dogana is the option to eat both buffet dishes (from appetizers to desserts) and specialties cooked on the spot, as noodles, grilled meat and fish dishes and soups prepared to your liking. Taste sushi or chicken with almonds just a few steps away from contemporary artworks is a recommended experience, especially if you are used to thinking that Rome offers only ancient ruins and sad tourist menus. To satisfy the needs of an increasingly mixed clientele, there is Porto Fluviale, a restaurant that has as a strong point the variety of dishes in a big venue. The restaurant, in fact, is open from early morning and is divided into bar, lounge area, restaurant and pizzeria. Let’s have a look at people here: someone comes only for weekend brunches, other customers prefer to have a drink after work, while many people like the dinner menu to rediscover the most traditional Italian dishes. Porto Fluviale is in tune with the style of the district: modern, accessible to everyone and attentive to detail, both in dishes presentation and in interior design. Made in Eataly, the triumph of tastiness! The spark that started it all in Ostiense is definitely Eataly, situated just next to the railway station served by high-speed trains. This brand is now worldwide known and its success is due to the great attention to the Italian excellences and to the offer of high-quality food at affordable prices. This means that inside Eataly here are restaurants but also a market provided with all sorts of delicacies, including those goodies that you’ll never find in a supermarket. 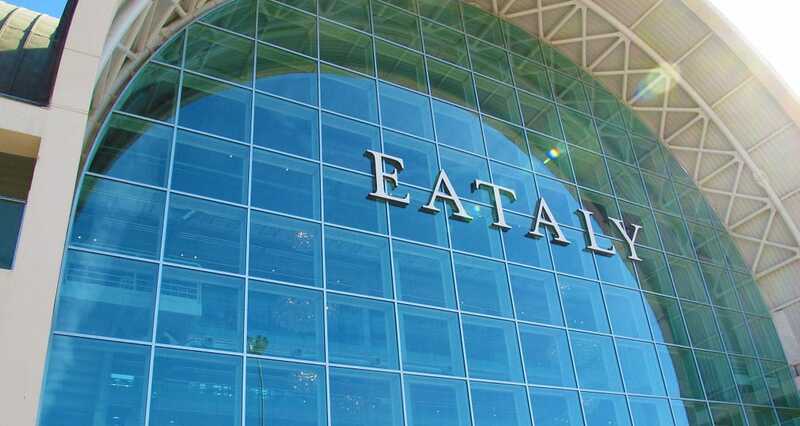 Thanks to Eataly Romans and tourists can enjoy the best eno-gastronomical products of Made in Italy and cultivate a passion for excellence, the same one that makes us famous and envied abroad. Going on a journey through the most delicious flavors, in Ostiense you will find the landing place you have always wanted. 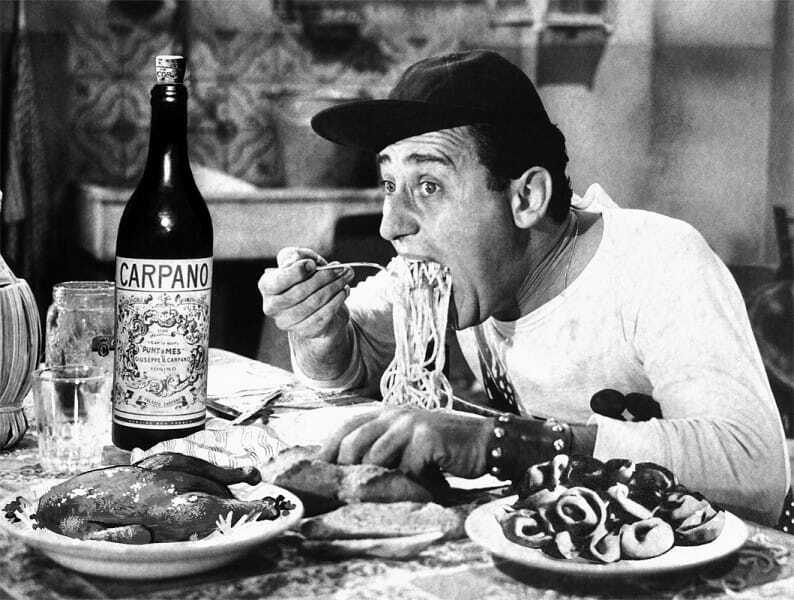 So…Are you ready to taste some delicious dishes in Roma Ostiense? Wow, great view from “gourmet district”.